Welcome to Coco Mat Supply. We are proud to offer you the most comprehensive selection of high quality coco mats and coir mats including personalized coco mats, printed coco mat designs, coco welcome mats, vinyl backed coco mats, drag mats and coco mat accessories. 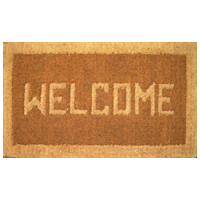 We welcome the opportunity to help you with any of your floor mat needs. Please contact one of our floor mat specialists for immediate assistance. 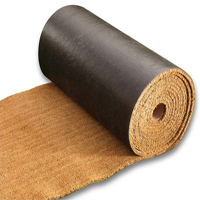 Coco Mats are made from coconut husk fibers and bound in a heavy-duty vinyl backing. All coco mats, regardless of thickness, aggressively scrape debris and mud. Durable coconut fibers brush and wipe shoes. The deep-pile design keeps debris below the surface. Perfect in moderate to heavily trafficked areas. Vinyl backed Mats, cut-pieces and rolls available. Available in 7 colors and 5 thicknesses. 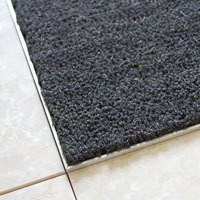 Our Home Door Mats are coco door mats and come in a wide variety of styles, thicknesses and sizes to fit perfectly in front of any residential door. These coco mats scrape away dirt and debris and allow water and snow to drain through. Several thicknesses and shapes are available in addition to rubber/coir mats, coir pattern mats, coco welcome mats, printed coco mat designs and personalized home door mats. Coco Logo Mats are a excellent way to promote your company's image and enhance your brand to attract and retain customers. Customized coco mats broadcast your logo while functionally cleaning shoes as people walk across. Perfect for recessed wells or surface-mounted areas and for both long-term & promotional use. Natural, eco-friendly coco fiber in all coco mats. Flocked coco mats and inlay coco mats available. Coco Alternative Brush Mats are rugged, synthetic fiber coco mats, which are perfect in highly-traffic / heavy-use locations due to their effectiveness at removing dirt, debris and moisture and holding up to the harshest conditions without shedding or fading. 8 colors available. Oversized and custom cuts available. Includes beveled borders for surface-mounted use. Ideal for heavy-traffic, indoor / outdoor areas. Vinyl Backed Coco Mats and Rolls are constructed of stiff and resilient coconut husk fibers, which act as scrub brushes on the soles of shoes. Deep-pile design traps dirt below the surface. Great indoor or outdoor mat. Available in several thicknesses. 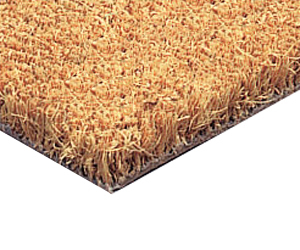 These coco mats can be recessed into the floor or used to cover long corridors and even be cut to length as needed. Coco Mats are produced in variety of colors other than the standard natural, tan color. Although the most popular coco colors, especially for higher traffic commercial use, are charcoal (black), grey and brown, we also offer three other coco mat colors including red, blue and green. These coco mats can be cut to any size or shape needed. All of our colored coco mats are available 3/4" thick.